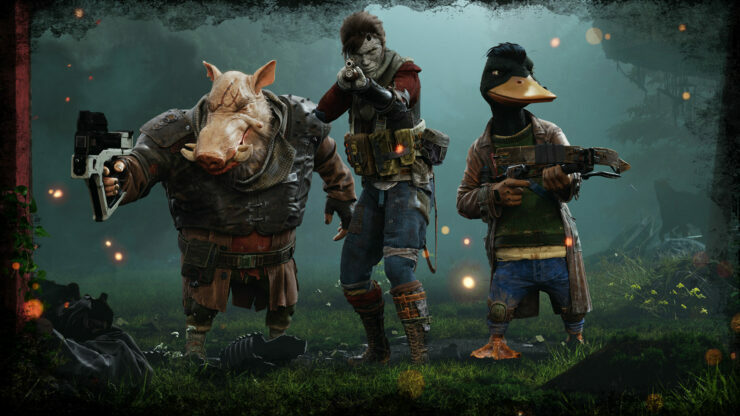 Mutant Year Zero: Road to Eden is set to release in just two months, on December the 4th for the PC, PlayStation 4 and Xbox One. Published by Funcom (Age of Conan) and developed by The Bearded Ladies, featuring talent with a history in the development of both Hitman and Payday, Mutant Year Zero: Road to Eden aims to be a ‘tactical adventure’ game that features the turn-based combat from titles like XCOM while also featuring real-time stealth and exploration. Bormin, Dux and Selma have just exited the Cave of Fear and are heading north towards a place called the House of Bones. But first they need to cross the river and to do so they must defeat a large group of zone ghouls who are controlling a massive metal boat. From what I’ve seen, it looks like Mutant Year Zero will be able to scratch that pulsating tactical itch I often find myself getting. Furthermore, it’s set in an interesting world where even the characters you control are different to what you’re normally used to. Granted, the team don’t have the most imaginative names – Dux for a Duck, Bormin for a Boar and Timothy Pennyweather the Third for a now revived 18th-century British aristocrat. The last one may not be completely accurate. When it releases on the 4th of December, Mutant Year Zero: Road to Eden will be available as a Standard Edition and a Deluxe Edition. The Deluxe Edition will include a desktop wallpaper, digital artbook, digital soundtrack, and a digital copy of the Mutant Year Zero pen-and-paper RPG book. In addition to this, Pre-ordering the Standard Edition will give you a three-day head start at launch while pre-ordering the Deluxe Edition gives you the same head start as well as access to a Beta version of the game before launch.